A simpler wallie from me ^_________^. I had to extract those flowers too from the scan. Was worth it though. The cherry blossoms in the stripe thingy are stock too. Chii's meant to be in some sort of frame. Faves and comments are appreciated! This is definatly one of my fav walls from u! :D It's sooooo pretty! The flowers and the sparkles make it look really magical! And Chii looks prettier than she is! ^____^ The sakuras around her look so sweet! aww so pretty! I love Chii! 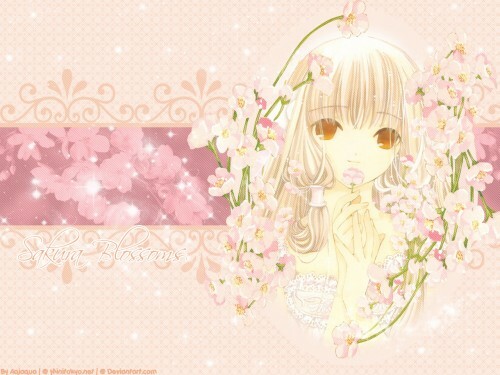 lol I have too many chobits wallpapers ^.^ chobits has always been my favorite anime to use for wallpapers...bleh, only if Chii didnt have so much hair! lol your wallpaper is so pretty! I love pink~ you extracted a hard scan very nicely! I still havent attempted to extract chii from that scan yet (ehhh..too lazy). i really like how you have those sakura flowers in the darker part of the wallpaper. the pattern is also very elegant and pulls everything together nicely. +fav! Anyway, so cute^^ spring is back... I like it, though I don't like Chii, flowers and pastel colors in general. Lovely...Chii is definitely delicate in appearence. If she were human, she might have a few "thin girl" health issues, though. She's a little bit stupid... yes... also in her own anime, and in Tsubasa too, but is true that she is cute too... hehe..
wow its just amazing... Favs! Aw...this is so pretty! :D She does look pretty and the sparkles! Simple-ism and sakura blossoms! :D Great wallie. I love the soft backdrop and the pink! My goodness--the pink! The texture was a nice add too. Chii's scans are really hard to work with and using that texture helped get rid of or cover over some of the fault of the scan--not really the scan but the way original artist draws Chii...I hope I makes sense. the baground is very soft, that makes Chii looks more cute! Wheeeee such a bright wall~~ blinded me when I downloaded it XD The patterns and the flowers work very nicely with the scan here, awesome~~ Keep it up! Your wallpaper looks perfect! Its parts match perfectly! Everything looks so cute and delicate. I loved it! ++++ fav! The color used effectively, and Chii is soooo beautiful here..